The real trouble with Alchemy in games is that it – unlike most of the magic systems you find in games – actually has a lot of history. Like it or not, the primary feature of virtually all systems of magic that promise real, directly observable, results has always been failure to work. Drawing pictures on cave walls to magically summon game failed to prevent starvation and bad hunts. In fact, it failed to prevent many of the animals depicted from going extinct. Babylonian attempts at weather control failed. Sympathetic attempts to grind down enemies by carving their images where they could be walked on failed. Egyptian nymic magic failed. Magical talismans failed. Taoist sorcery failed. Demon summoning failed. Failure, failure, failure. Every mystic was free to interpret their sources in their own ways, and free to make stuff up, and free to pass on their own visions to their students, because most of it didn’t do anything anyway. What counted was being able to extract support from the people around you thanks to your “magical powers”. Of course, every once in awhile, someone found something that actually worked by some means other than suggestion, fraud, or claims of visions (usually backed by some shrewd guesswork). The trouble was, in most cases, no one could separate the actual working bits from the stuff that just happened to have been going on. Thin margins of survival did not encourage experimentation – so the same fifteen worthless ingredients went into the brew the next time, along with the two that had happened to help. Then it got used on six different conditions which looked the same from a quick glance. After all, that stomach pain might be an ulcer, or cancer, or any of several other things. Still, it happened slowly. Eventually enough experiences piled up to reveal that it didn’t matter much what magical invocation you used when you planted seeds; if it rained enough, they came up anyway. More complex processes take longer. People are STILL looking for magical ways to influence the weather. Don’t YOU “know” that, if you want rain, all you have to do is water the garden? Or, if that doesn’t work, just wash your car! All the stuff that actually worked when someone who wasn’t convincing or faking used it got extracted from the magic and converted into engineering rule-of-thumb and then into science. It wasn’t that scientists and engineers disliked mysticism on principle. Sir Isaac Newton spent much of his life on mysticism after all. It was just that, despite all attempts, some procedures just didn’t do anything, and the engineers only got paid for things that worked. Alchemy lingered a long time. Quite a lot of it’s procedures actually did something useful, it was complex enough to that it wasn’t hard to find someone to pay you to monkey around with it, and because the laws governing chemistry are murderously complicated – and so it took a VERY long time to sort out which parts of the various procedures were actually important and how to generalize them. 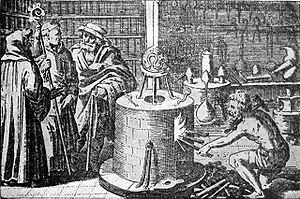 That means that Alchemy had centuries worth of practitioners – some of whom saw it as a mystical philosophical study, some of who focused on defrauding investors, some of whom really thought that transmutation was possible through heating and distilling, some of whom were making medicines, some of whom made poisons, some of whom were trying to transform living creatures, some who were practical metallurgists, and not a few who were flatly crazy – or who had poisoned themselves with mercury. A collection of cons used for defrauding unwise investors, making phony gems, and faking precious metals? Basic Chemistry, metallurgy, and herbalism with (in suitable worlds) a sideline in bringing out and exploiting the natural magical properties of materials? A way of producing an assortment of hideous poisons and giving yourself mercury poisoning while (supposedly) searching for the elixir of immortality? A term for the “profession” of crazed bombers? A series of mystical techniques used to refine materials for magical purposes? The art of imbuing materials with a limited amount of magic, either enhancing their natural effects (including magical ones) or storing magic in them? A complex series of operations that creates materials with exotic innate properties? A path of spiritual development, leading to the true Stone of the Philosophers and mastery of the secrets of the cosmos? A series of magical secrets, leading to the ability to create prefect or “true” materials, to transform living things, and to immortality? A magical discipline which grants the ability to transmute matter as desired? A method of brewing elixirs that produce blatant comic-book style magical effects? A craft which allows the creation of powerful permanently-enchanted objects? All of those are things which have fallen under “alchemy” in a wide assortment of historical documents, novels, comic books, movies, games and anime. Con Artistry and Forgery (#1). This doesn’t involve all that much “alchemical” skill, but it does include a lot of social ones. Low Alchemy (#2-4). This is classic alchemy for many games – making powerful acids and poisons, mixing up explosives and drugs, making disappearing ink, paste gems, phony gold, and other useful substances, and exploiting the natural magic of herbs and stones. Middle Alchemy (#5-6). This is advanced alchemy for many games – making magical potions, storing spells in dusts and talismans, and preparing magical components to enhance spells or to be easier to enchant. In general, however, it’s an entirely different discipline from Low Alchemy. High Alchemy (#7-9). This doesn’t come into most games. Liquifying light, creating metals that glow white-hot simply because that’s their natural temperature, universal solvents, elixirs of life, transcending mortality, learning the deepest secrets of the cosmos, invincible substances, and create-your-own creatures are all powers that tend to break games unless they’re fabulously awkward to use. Alchemical Magic (#10-11). In most games, this is just a restricted form of spellcasting. So you need to sprinkle a few drops of potion to make a mess of vines spring up and entangle your opponents? Another potion creates an impenetrable, if fast-decaying, crystal wall? This flask explodes violently when thrown? Yep. All blatant, comic-book style, gaming magic. Suitable for most adventure games. Enchantment (#12). This is usually restricted to higher-powered characters in most games – but the ones that allow it usually have procedures already in place. Fortunately, those are usually abstracted enough that you can simply presume that your “alchemist” is using alchemical methods. A full, grandmaster, alchemist might well be good at all of those (although skipping Con Artistry and Forgery is entirely reasonable in settings where the other notions actually work) – but doesn’t have to be. In low-magic worlds, low alchemy may provide much of the party’s magic. A good middle alchemist may be quite effective in a party, providing useful supplies. A low alchemist may reasonably progress to middle – and possibly even high – alchemy as the game moves on. Alchemical Magic may be limited in some ways, but it often covers both offensive, defensive, healing, AND utility magic – which can be hard to get in a package any other way.